The Twilio stock price has surged a whopping 296% over the last two months. That makes it one of the best-performing tech stocks of 2016. Its gains are more than eight times the size of Microsoft Corp. (Nasdaq: MSFT), Amazon.com Inc. (Nasdaq: AMZN), and Facebook Inc.'s (Nasdaq: FB) combined 33.4% return. But shares of Twilio Inc. (NYSE: TWLO) could see an unexpected drop after Dec. 20, 2016. And we found one important reason why it could fall after that date. Twilio is a cloud software company based out of San Francisco. It's mainly known for developing in-app messaging capabilities for smartphone applications. For example, Uber – the ride-sharing company that's the world's highest-valued startup – uses Twilio's messaging software to let users message their drivers. Another one of Twilio's clients is WhatsApp, a messaging service with roughly 1 billion monthly active users. It also works with publicly traded companies like The Coca-Cola Co. (NYSE: KO) and Zendesk Inc. (NYSE: ZEN). On June 22, the Twilio IPO raised $150 million by selling 10 million shares at $15 each. It became the first "unicorn" to go public since Square Inc. (NYSE: SQ) in November 2015. Unicorn is a term for private tech companies with a $1 billion valuation. TWLO's returns since the IPO have been tremendous. The Twilio stock price rocketed 92% in its debut, which is the biggest first-day pop for a tech firm since 2014. It has gained a staggering 296% from its $15 offer price. That makes it the second best tech stock to hit the market in 2016 after Acacia Communications Inc. (Nasdaq: ACIA). But those gains could turn to losses after Dec. 20, 2016, which means investors should sell their positions before it's too late. Twilio's status as one of the top tech stocks of 2016 could be ruined once its IPO lock-up expires on Dec. 20. Once a new stock hits the market, institutional investors – like Wall Street banks and hedge funds – are restricted by a lock-up period. This is the stretch of time after a stock begins trading in which they can't sell back their shares. Lock-ups prevent these big-time investors from selling their shares at inflated prices typical of a stock in the months following its IPO. After the lock-up period ends, banks and hedge funds can immediately sell their millions of shares. That dramatically decreases the stock price and causes losses for investors who bought shares before the lock-up expiration. This has happened to many popular IPOs in the last year. 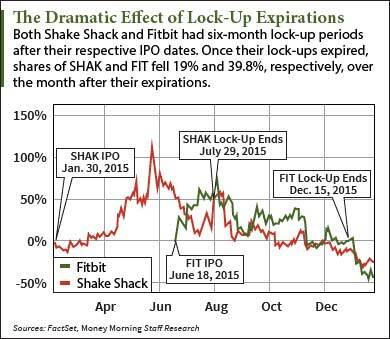 For example, Shake Shack Inc.'s (NYSE: SHAK) six-month lock-up ended on July 29, 2015. Shares declined by more than 19% over the following month of August. The Fitbit Inc. (NYSE: FIT) stock price crashed 39.8% from its lock-up expiration on Dec. 15, 2015 to Jan. 15, 2016. All of this means the Twilio stock price could be headed for the same plunge. If you own shares of TWLO stock, we recommend selling them before the company's IPO lock-up ends on Dec. 20. But Money Morning Chief Investment Strategist Keith Fitz-Gerald says investors looking to buy into IPOs should be patient. Since stocks are often volatile after their lock-up ends, it's important to wait for them to settle down before making any investing decisions. 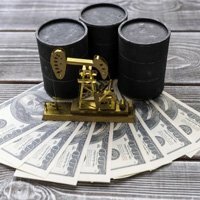 "Wait until the euphoria has passed and the insider lock-up period is over," Fitz-Gerald – a market veteran with over three decades of trading experience – told Total Wealth readers last year. "You want to give the institutional traders time to separate nervous traders from their money. Then, average in over time if you want to own shares." This is just one of Fitz-Gerald's three steps required to profitably invest in IPOs. He devised this strategy so investors can avoid losses and play these new stocks for safe, long-term gains. Alex McGuire covers initial public offerings for Money Morning. Follow him on Twitter for breaking IPO news. Will it still climb up over next couple months and if you believe it might, why ?